The electrical oscillations, produced by an ultrasonic generator, are converted by the ultrasonic transducer (converter) into mechanical oscillations of same frequency and transmitted over a transformation distance piece (booster) and the sonotrode (welding tool) to the workpiece. The shaped parts at the joining areas, which can be welded, are plastifised and welded by the effect of the ultrasonic with use of pressure. For the achievement of a reproducible good welding quality, particularly the selection of the correct US-welding set, the raw material-conditioned influences of the thermoplastic plastics and the constructional organization of the shaped parts (workpieces), as well as the formation of the joining areas and working with optimized welding parameters, are substantial influences. Gas density connections are realizable. By ultrasonic flanges and rivets, thermoplastic can be connected even to kind-strange materials. 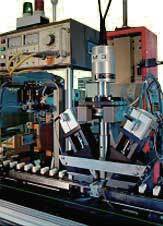 Ultrasonic-welding is outstanding suitable for automation due to short cycle times. The sonotrode transfers the ultrasonic vibration and the welding force to the upper wokrpiece. The lower workpiece is fixed on the welding anvil. By the produced relative motion betweeen the both parts, which are to be welded, the surface as well as the coating of oxid are removed and the crystal lattices get so close together, tha mutually lattice forces in the adding zone become effective. The connection gets created below the welding temperature. With US-metal-welding punctual overlapping connection are produced. It is also possible to connect ring-shaped diameters and roll-seam-welds. The jointing part assigned to the sonotrode should be as thinly and mass-poor as possible. The jointing part may not be greasy and have to be parallel to the coupling surface of the sonotrode. During welding a deformation arises in the adding zone, which particularly has the consequence of a reduced diameter of the Sonotrode assigned parts. Ultrasonic-welding is outstanding suitable for automation due to short times. Cu-enamelled-wire, braid welding, welding of aluminium cases, connecting metal and ceramel. At ultrasonic-soldering cavitation is produced with help of a swinging sonotrode in a liquid plumb. The part, that is to be soldered, is dipped partially or completely into the plumb-bob. By cavitation one understands a breaking of the liquid plumb-bob in the course phase of the ultrasonic vibration and the smashing of the tiny vesicles in the pressure phase. Hereby a pressure wave next to the cavitation vesicles arises, which blows the oxide or the impurities off of the surface of the soldering parts. Element connections with strongly oxidized and/or difficulty solderable surface, continuous soldering of wires and containers, tinning of aluminium condenser windings. Pressing-processes can reduce the insertion strenght and the load of the joining construction units by the ultrasonic agitation. Ultrasonic-supported pressing in and adjusting of relay cores, drawing up of gear wheels and cluth on platen waves for printers, pressing in threaded inserts. The change of detention characterisitcs in a swinging sonotrode and the effect of cavitation with ultrasonic-mixing and applying are used for small quantities by multi-component adhesives. After setting of the sonotrode the different components at the lateral surface are flowing to the tip of the Sonotrode after switching on the ultrasonic, where the mixture takes place. The drop of multi-component adhesive is applyed by the lowering the Sonotrode to the carrier. The advantage of this procedure exists in mixing the individual components briefly befor their use. Therefore no Topfzeitprobleme arise. By use of the cavitation in liquids purification processes, as well as the separation of sticking parts, can be supported.